Designed by the one and only Faye Tan, to whom I owe a massive debt of gratitude for being the ever-ready sounding board for the event, and the patient designer for all the posters that you see. (This is a lengthy, post that bounces around a somewhat, about Paradigm Shift, how and why it happened. You are welcome to challenge my opinions, ask questions about things and discuss anything that comes to mind. Paradigm Shift - Shifting Into Second is in the books. What’s there to say about it? It was never a sure thing that a second edition of the event would take place. After 2017’s inaugural edition of Paradigm Shift, I uprooted myself from Singapore, where I had lived for more than 12 years, and headed off to explore the world. The main intention behind the first Paradigm Shift was to do something really fun before my tenure in Frontier Danceland and Singapore came to an end. It was a plan to go out with a bang, and Paradigm Shift was the perfect platform for a variety of reasons. Dance has been a part of my life since before arriving in Singapore. (This was before YouTube existed, or was easily accessible, and certainly before tutorials were amazing. Who else tried to learn 1990s off a gif and series of typed out instructions from a website like Style2Ouf?) Once Singapore became my home, I spent many years wandering around the street dance scene, and connecting with the odd individual here and there. And then contemporary dance started, and I went to NAFA, and danced in Frontier Danceland. This journey was one I embarked on alone, though. Most of my friends in the street dance community that I talked to had never watched a Frontier show, and a few had not even heard of it. Paradigm Shift was one way to remedy that situation. Also, street dance was something that I never completely left behind. In the midst of having to point my feet or float through a Gaga class, the desire to rock a beat or flare or backflip or something or other never disappeared, and in late 2016 and early 2017 the effort was made to connect with this side of myself more actively. This led to sessions at SMU, and through these sessions I realised that more and more street dancers were becoming interested in exploring the expressive, theatrical side of dance, while I just wanted to jump back into the vibes of street dance. Paradigm Shift! A “contemporary dance battle” that was intended to bring the street and contemporary, commercial and theatrical dance scenes together. A chance for everyone to get together and get down, and to show each other what dance really is in the contemporary sense. For everyone to get out of their heads and bubbles and see what else is happening within the island community that they may have missed, to network and establish a chance to talk and develop future collaborations or learning and teaching opportunities with each other. That’s why the first edition of Paradigm Shift took place in 2017, and I’m hugely grateful to Frontier Danceland and my ex-boss, Miss Low Mei Yoke, for letting it happen. There’s also a huge debt of gratitude to be paid for Miss Low allowing the organising of Paradigm Shift to be continued independently of Frontier Danceland, like it was this year. And although Frontier did come on board as a collaborator for Shifting Into Second, there was no guarantee that we would continue to work together, and that Paradigm Shift would continue to be organised. And that brings us to NAFA, my alma mater, where I studied pointing my toes and contracting the transversus abdominis (Martha Graham! Martha Graham! Check out this video of the epic Robin Williams, though it doesn’t quite deal with contractions.). Dr. Caren Carino, the Vice-Dean of Dance, who judged the first edition of Paradigm Shift, was down to support the event right from the beginning. And eventually, through a series of negotiations - with the help of Bryan Lee, another dancer who most of the Singapore street dance scene should be familiar with, and another individual who was helpful, encouraging and involved right from the beginning of Paradigm Shift - we got things sorted out, and found ourselves a venue for Paradigm Shift - Shifting Into Second! There's one more person who's been hugely important to Paradigm Shift, both this year and last, and that's Faye Tan, my collaborator and co-conspirator in getting this thing organised, discussing ideas, meeting people to talk about where everyone thinks this should go, and designing all the great graphics that you see for the event. Thank you, Faye! Here’s where I give a huge shout-out to all the people who came up to me last year after Paradigm Shift, saying they wished that they had attended the event after hearing how it went down. Random individuals from a variety of different dance backgrounds who accosted me at various occasions. If not for you guys, I wouldn’t even have thought about organising the 2018’s event. So thank you, for your support and encouragement. And to all of you who came down to attend the event, or supported it in one way or another this year, thank you very much! This year, the event took a very different turn. Sure, our “main event” was still billed as a battle, but it had some pretty fun twists. More on that in a moment. We also doubled the length of the event this time, having a second day that consisted of a series of workshops and a closing party. 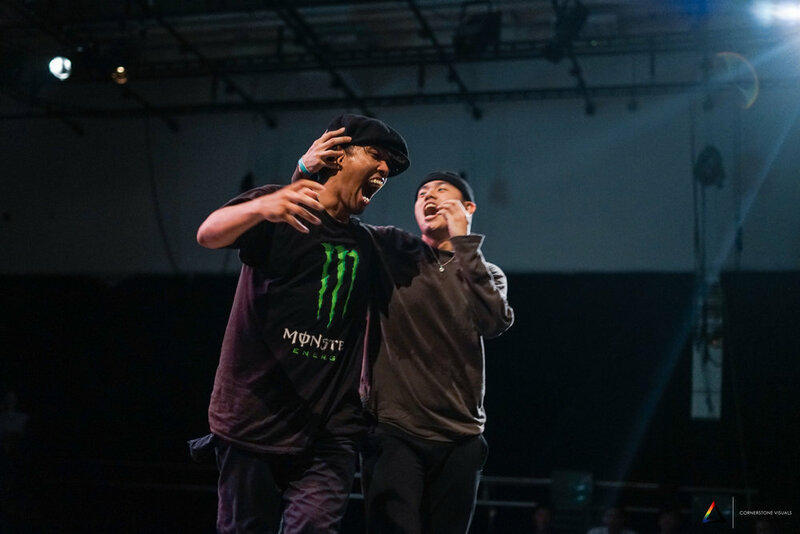 Some of the feedback received from last year was that although Paradigm Shift was sub-titled “A Contemporary Dance Battle” there weren’t many elements that actually made it “contemporary dance.” The main highlight of 2017’s event was the music played by the eminent DJ Bolo, aka Tan Zhiming. There were, all told, 13 different genres of music that they dancers had to dance to (including silence). The dancers would pick cards determining the musical genres of that round, the DJ would drop his tracks, and off the dancers would go. The reason for this choice of “challenge” was just to remind everyone of some of the musical possibilities that are available to us all as dancers, or as fans of music. Not everything is fun or easy to listen or dance to, but there’s always more out there from which we can draw ideas and inspiration. Officially, each round was meant to consist of a 1-minute solo per dancer, but as the event when on, more and more interaction took place, and things ended up being a gigantic freestyle improvisation game. It wasn’t how I envisioned things to go, but I’m really glad it went the way it did. Dancers didn’t come just to rep themselves and to throw their biggest moves. They came to dance with other people, to enjoy dancing together and sharing crazy, ridiculous, hilarious and amazing ideas that translated into an evening of fun and good spirits and enjoyment. Don’t take my word for it. Watch the videos. Read what other people had to say. And so this year, some of that feedback was taken into account. Rather than simply changing up the music with each round, the dancers were given tasks that challenge the sensitivities that contemporary dance often taps on. Namely, the ability to connect with another dancer, and also the dancers’ ability to portray emotion in their dancing (and I don’t mean executing amazing pirouettes while crying because the song says your lover died, but making us feel like crying while you do pirouettes because your whole body exudes sadness; or joy, or anger, or frustration, or hilarity, or whatever else you feel like portraying). You don’t need to read about the details here. There are videos. The channel is here. You’ll see what’s up. All you need to know here is that the dancers didn’t just have to battle each other; they had to work their way through a series of improvisational and choreographic tasks that took them to the finals. The finals though, those are worth mentioning. After having to rack their brains and think heaps about what they were going to do, now there was no real challenge or task set, besides the fact that the dancers were given a fairly long amount of time to dance. The only instruction to Nic Chung and Luqman - who coincidentally happen to be the two members of the Mellow Maniacs - was that they had from the time the DJ started playing music till the time she, FFINN, stopped. The two friends and crewmates chose not to battle one another. Instead, they put on a show, which included some of the best interactive improvisation I’ve ever seen in my life. There are no words. Just go watch the video. It’s right here. Luqman and Nic Chung, at the end of the finals. Photo taken by Elijah Zechariah@ejhzqn. At the end of the event on the 19th, I stated that Paradigm Shift seeks to be more than just something that happens once a year. The hope is that Paradigm Shift will be a community in Singapore that brings dancers from all backgrounds together. We want to gather to train, to learn from each other, to play, experiment, create and one day, perform. It shouldn't just be about dancers too. To have artists like Zhiming AKA DJ Bolo and Fiona AKA FFINN come on board to play music for us, and to work together to open more doors in the public space and in our minds as well. Ultimately, we also want to remember that our dancing is not just for us. We create to entertain others, yes, but also to move them emotionally, to inspire, to do whatever it is that you may dream of doing with dance. Paradigm Shift is over, but the dance doesn't stop. Do keep your eyes open for these upcoming events and the groups associated with them! First off, there is the official Paradigm Shift group. Join us for calls to session and cipher, and to engage with some really weird dance situations. And of course, to see what else is happening with Paradigm Shift as an event, but also as a community! Coming up in a few weeks time, we have Culture Circle, an event that Clarence, the organiser, graciously moved to the 16th of June so that Paradigm Shift -Shifting Into Second could happen this past weekend. Culture Circle is a 2 vs 2 dance battle that is open to everyone, regardless of what dance background you come from. Open Concept, organised by Nicholas Chung, co-champion of Paradigm Shift, is a showcase competition and all-styles abstract dance battle that seeks to bring together dancers from different backgrounds to dance to a wide variety of music, and for everyone to challenge each other to do better! Find out more at the link below! Dance, it must be remembered, is much more than just battles. The Working Group for Dancers' Advocacy seeks to help dancers make a living dancing professionally in this modern world, connecting dancers with professionals from other fields in order that we may better navigate this modern life. Their next event will discuss how we dancers can produce our own shows, instead of waiting for somebody else to give us a job. The event page isn't up yet, but you can find out more by joining the group at the link below. And let's not forget The Flux Collective, a new group put together by Ethel Foong and Natalie Khoo that seeks to promote the development of contemporary dance specifically among those below 25. The collective will be organising a contemporary dance competition, by dancers for dancers, that will take place in September. Finally, do follow Frontier Danceland and the Nanyang Academy of Fine Arts to find out about upcoming performances or opportunities to learn and grow.